You’ve got a business to run, we help simplify running it. 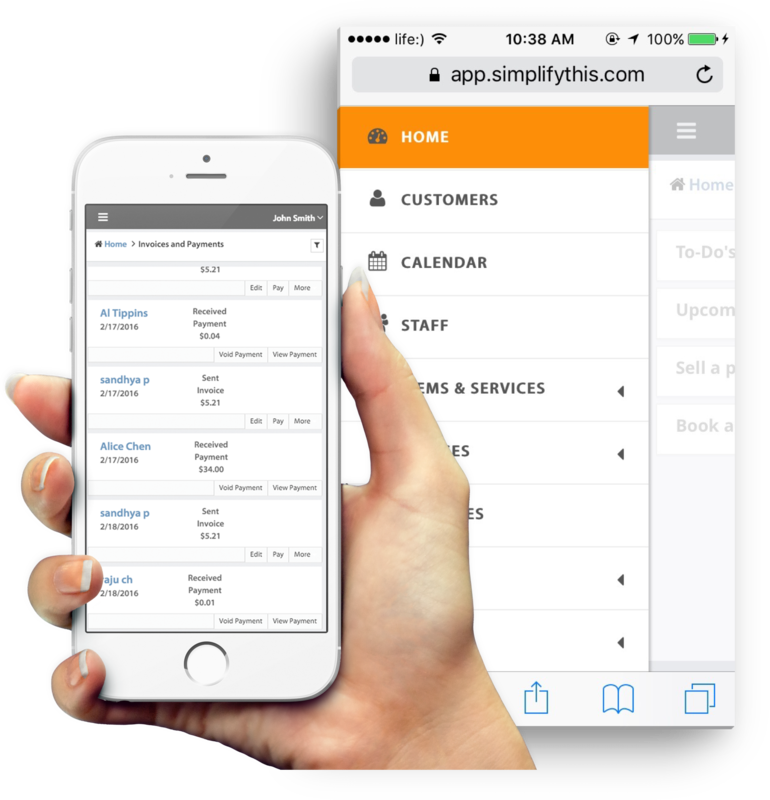 SimplifyThis is loaded with features to help streamline your scheduling, invoicing and billing. 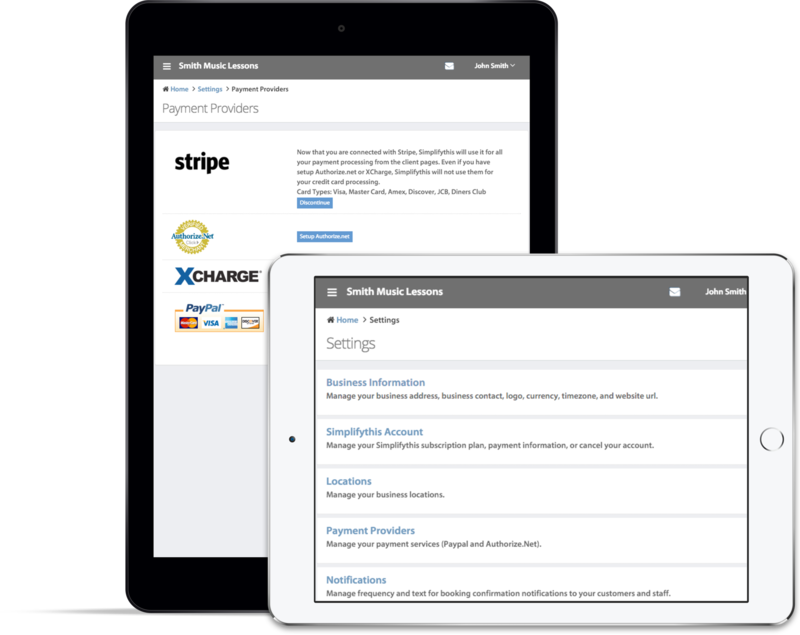 Let customers schedule appointments online, send professional invoices, and accept payments easily online. SimplifyThis works with your computer, iPhone, Android or tablet, just use your favorite browser and SimplifyThis automatically adapts to your device. Android users can also download the Android app from the Google Play store. You can access SimplifyThis from your computer, Android phones and tablets, iPhones and iPad, and Windows phone. Download the SimplifyThis app for Android devices from Google Play store. iOS apps are coming soon! In the meantime, you can use your browser from iPhone or iPad to access SimplifyThis. Easy setup and easy to use. Get started in minutes. SimplifyThis offers your small business a flexible and simple to use Scheduling and Billing system. A few minutes is all it takes to sign up and set up. Then, import your client list, add your staff, list your services or classes, and you are good to go! Send statements, receive payments, track balances all within one system. Group transactions for families and businesses under a single account. Receive payments online through credit card or Paypal. Bill clients directly from your calendar. Send invoices and statements over email and receive payments online. Group transactions for families / businesses under a single account. Receive payments through credit card or Paypal. Scheduling and Billing, all from a single screen. Simple! 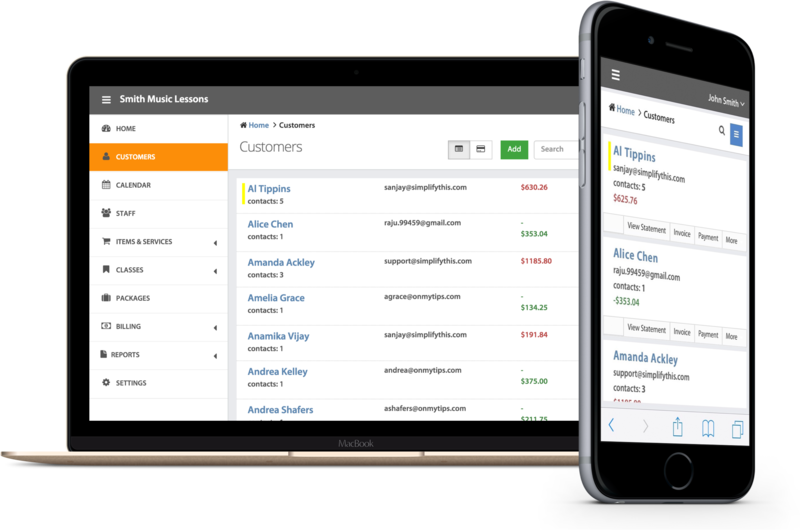 Manage your clients--their appointments, packages, invoices, account history, and more--all in one page. You can also view and manage a family or group in one single account. Customize your service offerings by price and length of appointment. Sell products, like a music sheet, a yoga mat etc. along with your service. Create group sessions or one-off classes, allow customers to book a series of lessons, say a 4-week summer course. Book, bill, and track attendance easily. Bundle your services and group lessons into a package, for example, a 10-class card. Offer your clients a package deal. Enable your staff to manage their own schedules and configure the services they provide. Each member can have their own login with controlled access and permissions. Track account balance, and charge your clients for services directly with a single click. Send out detailed statements and invoices to your clients. SimplifyThis integrates with Stripe, Paypal and Authorize.Net so that your clients can pay you online easily. Clients can pre-pay as they book, or pay after receiving an invoice or statement. SimplifyThis is easy to set up and configure, and easy to use. You will get going in minutes, and your clients will find it intuitive and simple to use. SimplifyThis has made managing music lessons to a group of 25+ students each month faster and easier. When I looked at online appointment calendars, none of the applications had the features I needed at a price point I could handle, except for SimplifyThis. I rely on SimplifyThis to keep track of my service appointments, invoices, and payments. The IT Workers in my section were amazed that they could have secure online access to their coffee account. SimplifyThis provides appointment scheduling and billing software for small business owners to manage thier business from their smartphones, tablets, and computers. Easy to use, customizable booking system makes it convenient for your clients to book your services and classes and fills up your calendar. Integrated billing and payment system lets you charge your clients for the services and classes and tracks invoices and payments for you.